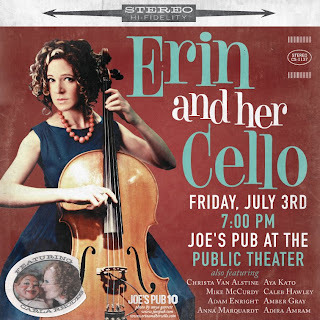 ERIN AND HER CELLO LIVE AT JOE'S PUB AT THE PUBLIC THEATER! FRIDAY, JULY 3rd, 2009 7pm SHARP with SPECIAL GUEST CARLA RHODES FULL BAND SHOW!!! TABLE RESERVATIONS: 212-539-8778 Purchase of tickets does NOT guarantee a table reservation; you must call to reserve seats. Seating, as well asstanding-room, is available only on a first-come, first-served basis for all shows without a dinner reservation. Two drink or $12 food minimum per person is standard.